At Twin Air we hope everyone’s heating system holds up fine through the winter. But we know at least some of you will have emergencies, so here’s a quick guide to some of the most common failures that might affect your system. Note most of these problems are not do-it-yourself fixes. Please be careful and know what you’re doing before trying anything, and always shut off the power/fuel to a system before opening it. The ignitor is the metal element that ignites the flow of gas by heating up like the coils in a toaster. It’s made of material with maximum electrical resistance (ohms) but which is also very brittle. Any crack or break will deadline it. Even moisture from your skin can degrade it, so never touch it with bare hands. If it fails, the only option is to replace it. 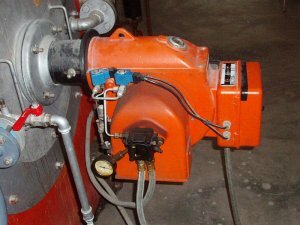 The gas valve is the valve that allows a flow of gas to supply the heat of the furnace. There is a little thing called the thermocouple which sits over the pilot light and generates power from its heat. As a safety measure, the gas valve is held open by that electricity, and shuts if the thermocouple stops generating power. That way if the pilot light goes out the gas automatically shuts off. If your gas valve won’t open, check the pilot light. If that’s on, someone with an electric tester or multimeter can check to see if the thermocouple is generating enough power to keep the valve open (the amount may vary with your system). This is a job that would definitely be safer to have a professional do. The heat exchanger is a device that absorbs heat from the furnace’s combustion chamber and transfers it to circulation. During years of use it expands and contracts a lot, leading to eventual failure through metal fatigue. Though designed to last for ten years or more, they need to be inspected regularly for holes or cracks. Here you really want a professional; they have diagnostic tools that will detect so much more than just a flashlight. If the heat exchanger has failed, you’ll need a technician anyway. The nozzle is the part that sprays atomized heating oil into the combustion chamber, much like the fuel injector in a car engine. Seasonal condensation can cause rust, and buildup from the oil can clog it, so it needs annual cleaning. The electrodes, like spark plugs in your car, ignite the oil spray from the nozzle. They can get corroded after much use, shift in their mountings, or just crack. If they’re corroded or cracked you need new ones. It’s best to call a technician for this, as servicing the burner assembly requires lots of specialty equipment. The fuel filter is fairly straightforward. Like the oil filter on your car, this is a “consumable” part that should get changed regularly; in this case once a year. The ignition control is a little electronic box called the cad cell. It talks to the thermostat and the burner, and turns the burner on when the thermostat calls for heat. Essentially a small computer, it is one of the parts you should leave to the professionals to fix. But one important note about it: The cad cell has a sensor that turns the burner off when it thinks there’s a problem. Sometimes if you hit the reset button it will resume like normal. But if it keeps tripping, do not keep hitting reset. Something is probably wrong and needs a qualified technician’s attention before it can be safely used again. The compressor is the part of a heat pump system that pushes refrigerant through the condenser. If the compressor won’t start or keeps dying, you can check for dirty air filter or obstructions around the intake. If the problem persists, you may have too little power going to the compressor, and if that’s not it, the compressor may be burned out. The condenser fan is a crucial part that moves air over the condenser to dissipate hot air during cooling season and cold air during heating season. If it breaks, the whole system stops working. Most common problems with the fan include insufficient power, imbalance, or dislocation from the axle. It’s probably best to get a technician for these problems. Smaller issues like leaf or twig obstruction you can usually handle yourself. Note: geothermal and air source heat pumps are liable to mostly the same problems, except that geothermal systems do not have a condenser fan. If there is too little refrigerant, it can’t pump heat either in or out. Also the condenser may shut down, since it needs fluid pressure to work. Adding more refrigerant is dangerous and should only be done by someone trained to EPA standards. The coils are the refrigerant lines that transfer heat in our out depending on need. Sometimes they leak, and need to be replaced, along with the leaked-out refrigerant. And if you don’t change the air filter often enough, dirt can build up in the coils and be hard to get out. We hope this has helped you understand your heating system just a little bit better, and be better prepared for the unforeseen. As with many things, an ounce of prevention is worth a pound of correction. If you have a system failure that needs the professionals in Northern Virginia, give Twin Air a call at (703) 754-1062.